Reasonably accurate estimates of 2015 ARC-CO payments are contained in May 27th farmdoc daily article. Compared to 2015 payment estimates, projections of 2016 ARC-CO payments are much less certain because little is known about how county yields will differ from expectations and a wide range of prices could occur in 2016 and 2017. Even given the uncertainties, we estimate 2016 ARC-CO payments because these payments could be important cash flows in 2017 if commodity prices remain low. 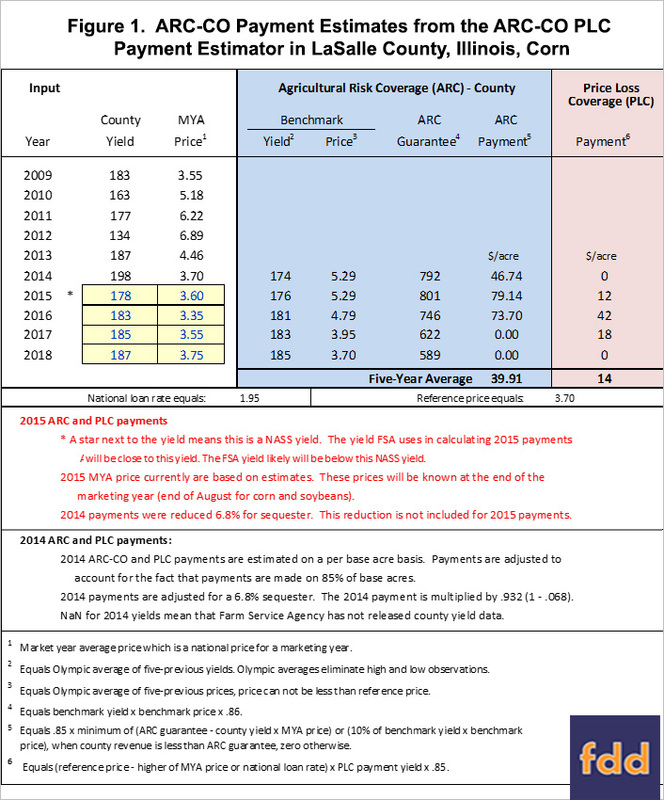 Herein, ARC-CO payments for 2016 are projected using yields at trend levels and prices at the midpoint of World Agricultural Supply and Demand Estimate (WASDE) ranges. At trend yields and mid-point prices, significant payments will occur for corn, soybeans, and wheat across the United States. As described in the final commentary section, the reasons for these large payments are the current low estimates of prices for the 2016 marketing year. Yield of 183 bushels per acre. The 183 bushels per acre is the trend yield estimate for LaSalle County. If the 2016 year could be repeated many times, the average of the county yields would be close to 183 bushels per acre. The default 2016 through 2018 entries for county yields in the ARC-CO PLC Payment Estimator are trend yields. Market Year Average (MYA) price of $3.35 per bushel. This is the midpoint of the national, MYA price contained in the May report of World Agricultural Supply and Demand Estimates (WASDE). The WASDE range is from $3.05 to $3.65. The default 2016 price entries in the ARC-CO PLC Payment Estimator are at WASDE mid-point prices. The $73.70 projected 2016 payment is the maximum payment given a $746 county ARC guarantee. As a result, lowering the $3.35 MYA will not increase the 2016 ARC-CO payment. At $3.65 – the high of the WASDE range — the 2016 ARC-CO payment is reduced to $66.01 per base acre. For MYA prices above $4.00 per bushel, ARC-CO payments will be modest unless county yields are well below trend yields. 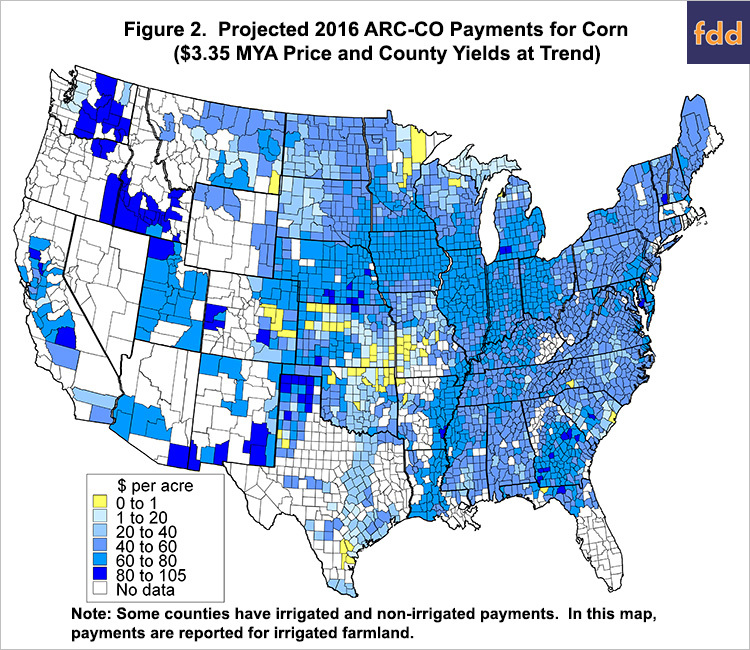 At trend yields and a $3.35 price, most counties in the U.S. would receive ARC-CO payments (see Figure 2). ARC-CO payments from $40 to $80 per base acre would predominate across the United States. All counties use the same market year average prices in the revenue calculations, but county yields will vary from there historical averages. As a result of this variation, ARC-CO will vary across counties. The soybean trend yield in LaSalle County for 2016 is 57 bushels per acre. The mid-point of the WASDE soybean range is $9.10 per bushel. At those values, the 2016 estimated ARC-CO payment is $53.69 per acre (see Figure 3). At $8.35 per bushel – the low of the WASDE range – the 2016 ARC-CO payment would be $57.51. At $9.85 – the high of the WASDE range – the 2016 ARC-CO payment would be $17.36 per base acre. A $10 MYA price results in $10.09 per base acre of ARC-CO payments. 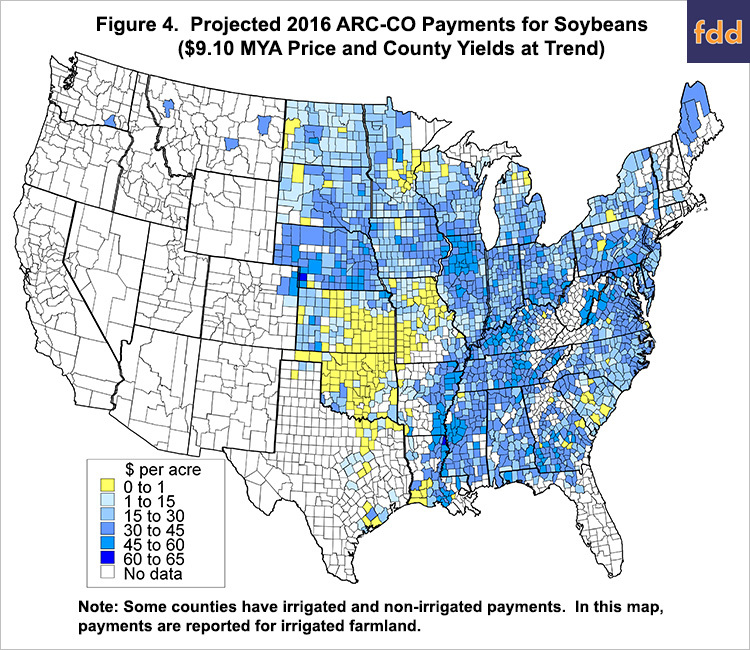 At trend yields and a $9.10 MYA price, many counties in the U.S. would receive ARC-CO payments in 2016 (see Figure 4). Payments in the $30 to $60 per base acre range would predominate across the United States. The wheat trend yield in LaSalle County for 2016 is 68 bushels per acre. The midpoint of the WASDE wheat ranges is $4.10 per bushel. At those values, the 2016 estimate ARC-CO payment is $39.30 per base acre (see Figure 5). The $39.30 is the maximum ARC-CO payment given an ARC county guarantee of $398 per acre. As a result, payments do not increase with lower MYA prices given that the county yield is at trend. At $4.50 per bushel – the high of the WASDE range – the 2016 ARC-CO payment still would be $39.30 per base acre, the maximum ARC-CO payment. The maximum payment would occur until the MYA price exceeds $5.16 per bushel. At this point, there likely is some optimism that 2016 wheat yields will be above average. At the $4.10 mid-point price, the maximum ARC-CO price will be received until county yield is above 85 bushels per acre, 17 bushels higher than the 68 trend yield. County yield would have to be above 96 bushels per acre before an ARC-CO payment is not received at the $4.10 mid-point price. 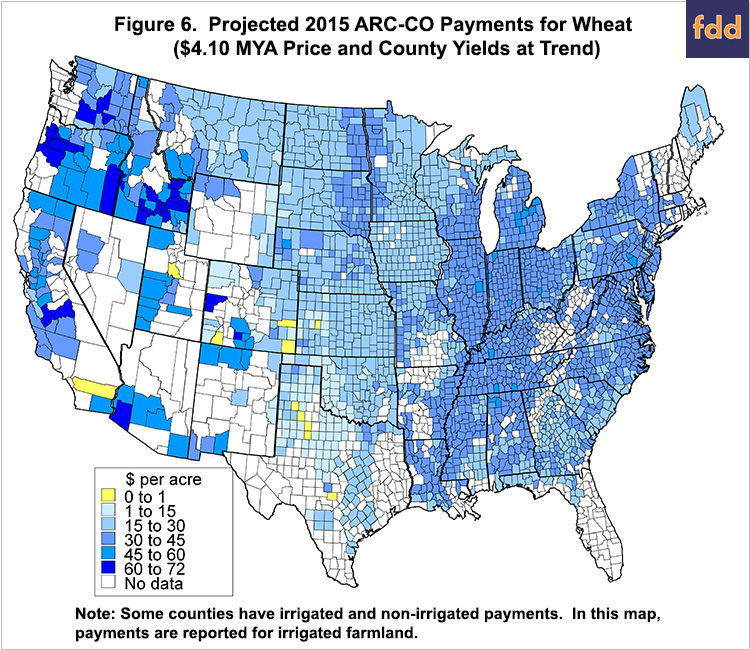 At trend yields and a $4.10 MYA price, many counties in the U.S. would receive ARC-CO payments (see Figure 6). Payments in the $14 to $45 per base acres would be common. Continued decreases in prices are the main reason for the relatively high ARC-CO payment estimates. The $3.35 MYA price estimate for corn in 2016 is $.25 per bushel below the 2015 estimates of $3.60 per bushel. Higher prices will result in lower ARC-CO payments. Currently, the corn and soybean MYA prices are well below harvest-time bids for 2016 fall delivery grain. This suggests USDA is expecting price declines moving into the fall of 2016. If payments occur, the 2016 ARC-CO payments projected in this article will be received in the fall of 2017. Much can happen between now and then. The 2016 MYA prices for corn and soybeans are determined based on average prices U.S. farmers receive from September 2016 through August 2017. Actual payment amounts will depend on the level of 2016 average county yields. 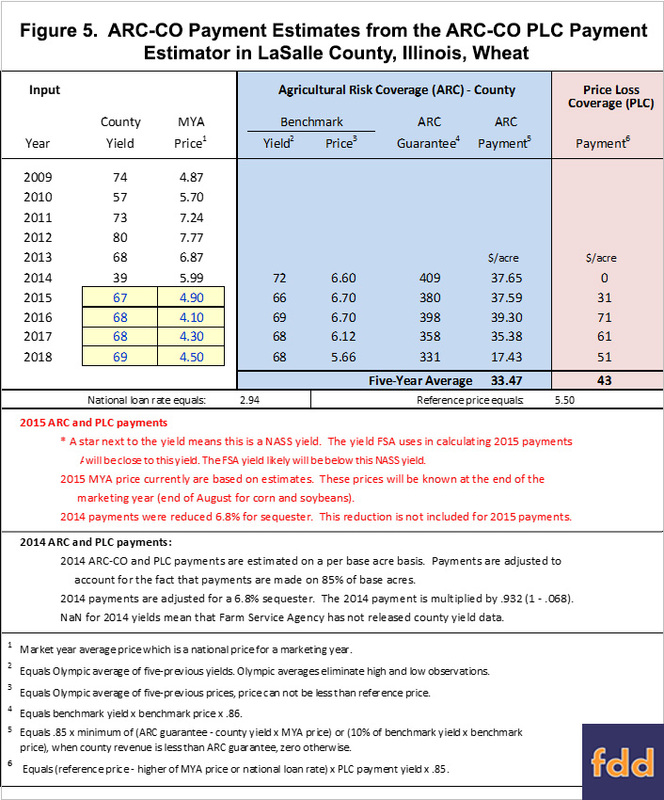 As occurred in 2014, ARC-CO payments will be impacted by county average yields. The maps shown in Figure 2, 4, and 6 suggest that payments will be relatively the same across counties. Our calculations use trend yields while actual yields will vary from trend yields even if the national yield is near trend. There will be variability in 2016 as there was in 2014 (click here for maps) and projected to be in 2015 (click here for maps). Those areas that experience higher yields relative to historical yields will receive relatively low ARC-CO payments and some may not trigger payments if the yields lift actual revenue above the 86% guarantee. Those areas experiencing low yields relative to historical yields will receive higher payments. Given the MYA used to generate ARC-CO payments, incomes will be very low. Negative 2016 incomes would result at these prices even considering 2016 ARC-CO payments (farmdoc daily, April 26, 2016). Therefore, these payments should not be viewed as eliminating the need to reduce cash flow now or through 2017. At best, these payments provide some temporary cushion as farmers continue to cut costs. Schnitkey, G., N. Paulson, J. Coppess, and C. Zulauf. "2015 Estimated ARC-CO Payments." farmdoc daily (6):101, Department of Agricultural and Consumer Economics, University of Illinois at Urbana-Champaign, May 27, 2016. Schnitkey, G., J. Coppess, N. Paulson, and C. Zulauf. 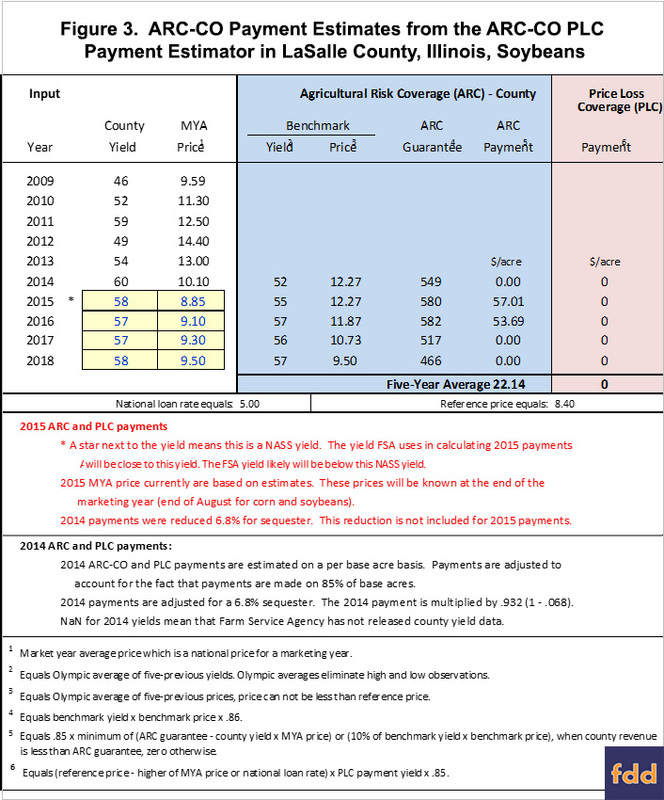 "2014 ARC-CO Payments: Release of 2014 County Yields." farmdoc daily (5):209, Department of Agricultural and Consumer Economics, University of Illinois at Urbana-Champaign, November 10, 2015.